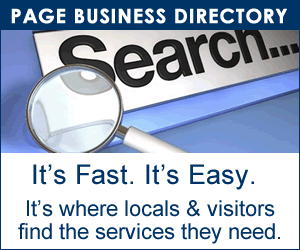 The Page Business Directory helps you find and access services in the Page and Lake Powell area quickly and easily. Press on phone numbers for instant calling from your mobile device. To list your business, call 928.645.8181 or contact janet@kxaz.com. CUMMINGS AND COMPANY 630 N. Navajo Dr. DOUBLE R COLLISION 13 Poplar St.
CRAZY NEEDLE CUSTOM CANVAS 32 N. 10th Ave. Suite 4. SUNSHINE AND SUNBEAM LAUNDRY 131 S. Lake Powell Blvd. AND 114 S. Lake Powell Blvd. GUNSIGHT REALTY 52 Reflection Canyon Dr.
Get listed now in our PAGE BUSINESS DIRECTORY, and ask about our annual rate savings plan. More than 97% of the population is searching for services on their computers or mobile devices. Some 25,000 visits a month to our site are searching for accommodations, restaurants, and services in Page, Arizona. Make sure your business is included. 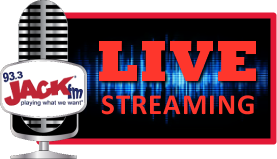 Contact janet@kxaz.com to get listed in the Page Business Directory. Our featured business listing plan provides both a basic listing and an individual business page on the LakePowellLife.com site. We recommend that you at least have a basic listing in our Page Business Directory. A Featured Business Listing will provide detailed information about your business on your own dedicated web page and includes 3 photographs.